A letter is one person's written message to another pertaining to some matter of common concern. Letters have several different types: Formal letters and informal letters. Letters contribute to the protection and conservation of literacy. Letters have been sent since antiquity and are mentioned in the Iliad. Both Herodotus and Thucydides mention letters in their histories. The famous Einstein letter from Edward Teller and Leó Szilárd to US President Franklin Roosevelt suggesting an atomic bomb project. Click here for page 2. Historically, letters have existed from the time of ancient India, ancient Egypt and Sumer, through Rome, Greece and China, up to the present day. During the seventeenth and eighteenth century, letters were used to self-educate. Letters were a way to practice critical reading, self-expressive writing, polemical writing and also exchange ideas with like-minded others. For some people, letters were seen as a written performance. For others, it was not only seen as a performance but also as a way of communication and a method of gaining feedback. Letters make up several of the books of the Bible. Archives of correspondence, whether for personal, diplomatic, or business reasons, serve as primary sources for historians. At certain times, the writing of letters was thought to be an art form and a genre of literature, for instance in Byzantine epistolography. In the ancient world letters were written on a various different materials, including metal, lead, wax-coated wooden tablets, pottery fragments, animal skin, and papyrus. From Ovid, we learn that Acontius used an apple for his letter to Cydippe. As communication technology has diversified, posted letters have become less important as a routine form of communication. For example, the development of the telegraph drastically shortened the time taken to send a communication, by sending it between distant points as an electrical signal. At the telegraph office closest to the destination, the signal was converted back into writing on paper and delivered to the recipient. The next step was the telex which avoided the need for local delivery. Then followed the fax (facsimile) machine: a letter could be transferred electrically from the sender to the receiver through the telephone network as an image. Today, the internet, by means of email, plays a large part in written communications; however, these email communications are not generally referred to as letters but rather as e-mail (or email) messages, messages or simply emails or e-mails, with only the term "letter" generally being reserved for communications on paper. Due to the timelessness and universality of letter writing, there is a wealth of letters and instructional materials (for example, manuals, as in the medieval ars dictaminis) on letter writing throughout history. The study of letter writing usually involves both the study of rhetoric and grammar. No special device is needed to receive a letter, just a postal address, and the letter can be read immediately on receipt. An advertising mailing can reach every address in a particular area. A letter provides immediate, and in principle permanent, physical record of communication, without the need for printing. Letters, especially those with a signature and/or on an organization's own notepaper, are more difficult to falsify than is an email and thus provide much better evidence of the contents of the communication. A letter in the sender's own handwriting is more personal than an email. If required, small physical objects can be enclosed in the envelope with the letter. Letters are unable to transmit malware or other harmful files that can be transmitted by email. Letter writing leads to the mastery of the technique of good writing. Letter writing can provide an extension of the face-to-face therapeutic encounter. Sender writes letter and places it in an envelope on which the recipient's address is written in the centre front of the envelope. Sender ensures that the recipient's address includes the Zip or Postal Code (if applicable) and often includes his/her return address on the envelope. Sender puts the letter in a postbox. The national postal service of the sender's country (e.g. Royal Mail, UK; USPS, United States; Australia Post in Australia; or Canada Post in Canada) empties the postbox and transports all the contents to the regional sorting office. The sorting office then sorts each letter by address and postcode and delivers the letters destined for a particular area to that area's post office. Letters addressed to a different region are sent to that region's sorting office, to be sorted further. The local post office dispatches the letters to their delivery personnel who deliver them to the proper addresses. This process, depending on how far the sender is from the recipient, can take anywhere from a day to 3–4 weeks. International mail is sent via trains and airplanes to other countries. However, in 2008, Janet Barrett from the UK, received a RSVP to a party invitation addressed to 'Percy Bateman', from 'Buffy', originally posted on 29 November 1919. It had taken 89 years to be delivered by the Royal Mail. However, Royal Mail denied this, saying that it would be impossible for a letter to have remained in their system for so long, as checks are carried out regularly. Instead, the letter dated 1919 may have "been a collector's item which was being sent in another envelope and somehow came free of the outer packaging". By writing both across and down, the sender of a letter could save on postage. 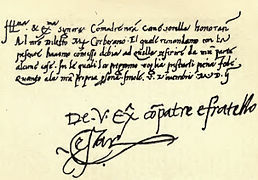 A hand-written letter of Cesare Borgia. A child's letter to Santa Claus. 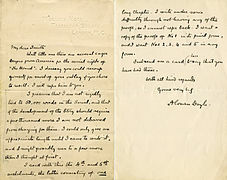 A letter from Arthur Conan Doyle about The Hound of the Baskervilles. An invitation letter to the ground-breaking of the Seattle Space Needle, 1961. The resignation letter of Richard Nixon, 1974. ^ a b Blake, Gary; Bly, Robert W. (1993). The Elements of Technical Writing. Macmillan Publishers. p. 125. ISBN 0020130856. ^ Homer, Iliad, 6. 167–70. ^ Ebbeler, J. (2009). "Tradition, Innovation, and Epistolary Mores". In Rousseau, P. (ed.). A Companion to Late Antiquity. Chichester: Wiley-Blackwell. p. 270. ISBN 978-1-4051-1980-1. ^ Carol Poster and Linda C. Mitchell, eds., Letter-Writing Manuals and Instruction from Antiquity to the Present (Columbia, SC: U of South Carolina Press, 2007). ^ Glenday, Craig (2013). Guinness Book of World Records 2014. p. 127. ISBN 978-1-908843-15-9. ^ "Royal Mail delivers letter 89 years late". The Daily Telegraph. 8 December 2008. Archived from the original on 13 April 2017. Retrieved 13 April 2017. The First English Family Letters at History Today. In cryptography, the clock was a method devised by Polish mathematician-cryptologist Jerzy Różycki, at the Polish General Staff's Cipher Bureau, to facilitate decrypting German Enigma ciphers. The method determined the rightmost rotor in the German Enigma by exploiting the different turnover positions. For the Poles, learning the rightmost rotor reduced the rotor-order search space by a factor of 3 (the number of rotors). The British improved the method, and it allowed them to use their limited number of bombes more effectively (the British confronted 5 to 8 rotors). Cryptanalysis of the Enigma ciphering system enabled the western Allies in World War II to read substantial amounts of Morse-coded radio communications of the Axis powers that had been enciphered using Enigma machines. This yielded military intelligence which, along with that from other decrypted Axis radio and teleprinter transmissions, was given the codename Ultra. This was considered by western Supreme Allied Commander Dwight D. Eisenhower to have been "decisive" to the Allied victory.The Enigma machines were a family of portable cipher machines with rotor scramblers. Good operating procedures, properly enforced, would have made the plugboard Enigma machine unbreakable. However, most of the German military forces, secret services and civilian agencies that used Enigma employed poor operating procedures, and it was these poor procedures that allowed the Enigma machines to be reverse-engineered and the ciphers to be read. The German plugboard-equipped Enigma became Nazi Germany's principal crypto-system. It was broken by the Polish General Staff's Cipher Bureau in December 1932, with the aid of French-supplied intelligence material obtained from a German spy. A month before the outbreak of World War II, at a conference held near Warsaw, the Polish Cipher Bureau shared its Enigma-breaking techniques and technology with the French and British. During the German invasion of Poland, core Polish Cipher Bureau personnel were evacuated, via Romania, to France where they established the PC Bruno signals intelligence station with French facilities support. Successful cooperation among the Poles, the French, and the British at Bletchley Park continued until June 1940, when France surrendered to the Germans. From this beginning, the British Government Code and Cypher School (GC&CS) at Bletchley Park built up an extensive cryptanalytic capability. Initially, the decryption was mainly of Luftwaffe (German air force) and a few Heer (German army) messages, as the Kriegsmarine (German navy) employed much more secure procedures for using Enigma. Alan Turing, a Cambridge University mathematician and logician, provided much of the original thinking that led to the design of the cryptanalytical bombe machines that were instrumental in eventually breaking the naval Enigma. However, the Kriegsmarine introduced an Enigma version with a fourth rotor for its U-boats, resulting in a prolonged period when these messages could not be decrypted. With the capture of relevant cipher keys and the use of much faster US Navy bombes, regular, rapid reading of U-boat messages resumed. The cyclometer was a cryptologic device designed, "probably in 1934 or 1935," by Marian Rejewski of the Polish Cipher Bureau's German section (BS-4) to facilitate decryption of German Enigma ciphertext. In postal history, a gallows letter was a letter with a "gallows" mark meaning "very quickly". Gallows letters were official letters or dispatches used by the Privy Council of Elizabeth I of England. To express an extreme degree of urgency of delivery, the letter had on the address panel a rough drawing of a gallows. Sometimes the picture included a hanging body. These drawings could also have repeated written directions as "haste haste", "post haste", "haste for life", "for life haste", etc.There are also modern forgeries of such letters. This is when counterfeit gallows marks have been applied onto original letters. The grill method (Polish: metoda rusztu), in cryptology, was a method used chiefly early on, before the advent of the cyclometer, by the mathematician-cryptologists of the Polish Cipher Bureau (Biuro Szyfrów) in decrypting German Enigma machine ciphers. The Enigma rotor cipher machine changes plaintext characters into cipher text using a different permutation for each character, and so implements a polyalphabetic substitution cipher. first declension, second declension, third declension, fourth declension, fifth declension. Each noun follows one of the five declensions, but some irregular nouns have exceptions. Adjectives are of two kinds: those like bonus, bona, bonum 'good' belong to the first and second declensions, using first-declension endings for the feminine, and second-declension for masculine and neuter. Other adjectives such as celer, celeris, celere belong to the third declension. There are no fourth- or fifth-declension adjectives. Pronouns are also of two kinds, the personal pronouns such as ego 'I' and tū 'you (sg. )', which have their own irregular declension, and the third-person pronouns such as hic 'this' and ille 'that' which can generally be used either as pronouns or adjectivally. These latter decline in a similar way to the first and second noun declensions, but there are differences; for example the genitive singular ends in -īus or -ius instead of -ī or -ae. The cardinal numbers ūnus 'one', duo 'two', and trēs 'three' also have their own declensions (ūnus has genitive -īus like a pronoun), and there are also numeral adjectives such as bīnī 'a pair, two each', which decline like ordinary adjectives. This list of Zatch Bell! episodes of season 2, describes the 50 TV episodes, begun in 2004, for level 2 of the Zatch Bell! anime. The series is known as Konjiki no Gash Bell!! (金色のガッシュベル! !, lit. "Golden Gash Bell!!) in Japan, was directed by Tetsuji Nakamura and Yukio Kaizawa and produced by Toei Animation. The series was aired on Fuji TV in Japan. They are based on Makoto Raiku's Konjiki no Gash!! (金色のガッシュ! !, lit. Golden Gash!!) manga series, and adapt the 11th through 18th volumes of the manga over fifty episodes. The plot follows Kiyo Takamine and his Mamodo (魔物, Mamono, lit. "demon") partner Zatch Bell in their battle against the Mamodo Zofis and his army of thousand-year Mamodos. The season began airing on April 4, 2004 in Japan on Fuji TV and ended on March 27, 2005. The English adaptation of the Konjiki no Gash Bell!! is licensed by Viz Media, and aired on Cartoon Network's Toonami block and the Canadian television network YTV. The episodes were collected into seventeen DVD compilations by Shogakukan and released between May 18, 2005 and June 21, 2006. The dubbed episodes of the second season of Zatch Bell! discontinued airing after episode seventy-seven on Cartoon Network on January 20, 2007. The Canadian YTV station however continued the series.This season uses five pieces of theme music: one opening theme with three closing themes in the original Japanese episodes, and one theme used for the opening and ending in the dubbed episodes. The Japanese opening theme is "Kimi ni Kono Koe ga Todokimasu yō ni" (君にこの声が届きますように, lit. "Let this Voice reach You") by Takayoshi Tanimoto. The first Japanese ending theme is "Stars" by King for until episode fifty-eight. The second Japanese ending theme is "Tsuyogari" (つよがり, lit. "Bluff") by Eri Kitamura until episode 75. The third ending theme is "Idea" by Tsukiko Amano until episode 100. The English opening theme is "Follow the Light" and the ending theme is "Zatch Bell! Theme" by Thorsten Laewe and Greg Prestopino. Lithuanian grammar is the study of rules governing the use of the Lithuanian language. Lithuanian grammar retains many archaic features from Proto-Indo European that have been lost in other Indo-European languages, and is consequently very complex. PC LOAD LETTER is a printer error message that has entered popular culture as a technology meme referring to a confusing or inappropriate error message. "PC LOAD A4" is the equivalent message seen outside North America. The "PC LOAD LETTER" message is encountered when printing on older HP LaserJet printers such as the LaserJet II, III, and 4 series. It means that the printer is trying to print a document whose paper size is set to "letter" when no letter size paper is available, either through supply exhaustion or supply size mismatch.The error message comprises three parts. "PC" is an abbreviation for "paper cassette", the tray which holds blank paper for the printer to use. These two-character codes are a legacy feature carried over from the first LaserJet printers, which could only use a two-character display for all printer status and error messages. "Load", in this context, is an instruction to refill the paper tray. "Letter" is the standard paper size (8 1⁄2 × 11 in.) used in the United States and Canada. Thus, the error is instructing the user to refill the paper tray with letter-sized paper. Variants are "PC LOAD LEGAL", meaning that the printer needs more legal size (8 1⁄2 × 14 in.) paper, and "MP LOAD [paper size]" meaning the printer needs paper in the "MP" (multi-purpose) tray, and "[paper size]" is the name of the size of paper specified for the print job. The message confuses people for several reasons. The abbreviation "PC" may mislead because it is widely understood — especially in the context of electronic office equipment — to mean "personal computer", suggesting that the problem lies in the computer, not the printer. The word "LOAD" is also ambiguous, as it can also refer to the transfer of electronic data between disk and memory. Furthermore, the word "LETTER" is associated with paper size only in the US, Canada and some Latin American countries; A4 is the standard size used in the rest of the world. In this case, "LETTER" means data or content of a typed letter or document. Thus, users encountering this message may believe that they are being instructed to transfer their typed letter (as in correspondence) to the printer, even though they have already sent the job to the printer. Older LaserJet printers do not automatically resize a page when the page size of a document does not match the paper that is loaded in the printer. When trying to print a document whose paper size is set to "letter" on A4-sized paper the message occurs. The error "PC LOAD A4" appears in countries using this paper size. However, as many (American-written) programs use "letter" as the default format, the confusing message is often encountered by non-American users who are unaware of the recovery procedure (empty print queue and printer buffer or press "Shift+Continue" and in extreme cases, restart printer and repeat). The LaserJet 5 introduced an easy-to-find "GO" button to override the warning message. Later LaserJet printers, with a number label on their paper trays, display a new message, "TRAY X LOAD PLAIN [paper size]" where "Tray X" refers to the number of the paper tray which is the setting for the print job, again "load" is the instruction to refill the tray, and [paper size] is still the size of paper needed for the job. The error message's vagueness was mocked in the 1999 comedy film Office Space. Roman is the fifth story CD released by the fantasy band Sound Horizon. It was released on November 22, 2006 through King Records. From Roman Revo himself started singing in the songs. Katsura Yukimaru also made a manga inspirated by Roman under the same name. The cuneiform ru sign is found in both the 14th century BC Amarna letters and the Epic of Gilgamesh. As ru it is used for syllabic ru, and alphabetic 'r', or 'u'. In the I-XII Tablets of the Epic of Gilgamesh, it has specific uses showing alternate renderings besides ru; as sign no. 068, ru, 250 times, šub, 6, šup, 3, and as sumerogram ŠUB, 1 time. In the Amarna letters, the sign is mostly used for ru, r, and u in the spelling of various words. Notably, for "bird", Akkadian language "iṣṣūru", in Amarna letter EA 28, (Tushratta to Pharaoh), titled "Messengers Detained and a Protest"; the messengers are referenced as "uncaged" birds, and "aren't they free to come and go as birds do?". The scribal rendering of the ru sign is dramatically different in some of the Amarna letters. In Amarna letter EA 15, Assur-uballit I of Assyria to Pharaoh, and Amarna letter 28, (using bird, "iṣṣūru") it appears as the standard, electronic rendition. The alternate rendition of the sign as shown in Amarna letter EA 364 is also found twice in the mid-length (to long) 69-line Amarna letter EA 362, Rib-Hadda to Pharaoh, used as "to send" (a letter/message), line 52, "aš-pu-ru", Akkadian "šapāru".Another example letter of usage, is for one line, Line 27 on the obverse of Amarna letter EA 147, Biridiya to Pharaoh, titled "A Hymn to the Pharaoh", a letter in pristine condition (minus a missing corner of the clay tablet). Of note, in the Akkadian language, using vowels a, e, i, and u, there is no "o", (or y as vowel). Any vowels used in a sign, can be interchangeably substituted for a different vowel. Also u (cuneiform) has special uses, and is only rarely used for the 'vowel u'. The ú (cuneiform)-(first prime) is the typical alphabetic 'u'. Shojo (処女), the Japanese word for "female virgin"
The Short Weather Cipher (German: Wetterkurzschlüssel, abbreviated WKS), also known as the weather short signal book, was a cipher, presented as a codebook, that was used by the radio telegraphists aboard U-boats of the German Navy (Kriegsmarine) during World War II. It was used to condense weather reports into a short 7-letter message, which was enciphered by using the naval Enigma and transmitted by radiomen to intercept stations on shore, where it was deciphered by Enigma and the 7-letter weather report was reconstructed. The Slingsby CAMCO V-Liner was a proposed advertising aircraft of unusual design of the 1960s. It was intended to display advertising using electric lights to be viewed at a long distance, and as such consisted of a long triangular frame carried between two sets of wings and fuselages. The prototype V-Liner was destroyed in a factory fire before completion and the type was abandoned. Snail mail and smail (from snail + mail) — named after the snail with its slow speed — is a retronym that refers to letters and missives carried by conventional postal delivery services. The phrase refers to the lag-time between dispatch of a letter and its receipt, versus the virtually instantaneous dispatch and delivery of its electronic equivalent, email. It is also known, more neutrally, as paper mail, postal mail, land mail, or simply mail and post. An earlier term of the same type is surface mail, coined retrospectively after the development of airmail. This happened between the 1970s and 1990s.Snail mail penfriends or penpals are those that communicate with one another through the postal system, rather than on the Internet which has become the more common medium. Some online groups also use paper mail through regular gift or craft hot topics. In some countries, services are available to print and deliver emails to those unable to receive email, like people with no computers or Internet access. Similar terminology was used in the 1840s to contrast the already-operating postal mail with the new telegraph. The Philadelphia North American stated: "The markets will no longer be dependent upon snail paced mails". "Direction of Endeavor for Chinese Christianity in the Construction of New China", commonly known as "The Christian Manifesto" or "The Three-Self Manifesto", was a political manifesto of Protestants in China whereby they backed the newly-founded People's Republic of China (PRC) and the leadership of the Communist Party of China (CPC). Published in 1950, the manifesto paved the way for the government-controlled Three-Self Patriotic Movement (TSPM) of Protestants. This movement proclaimed the three principles of self-government, self-support, and self-propagation. The drafting and content of the manifesto was, and remains, controversial to this day. The manifesto was devised after Protestant leaders presented their concerns with religious freedom to Zhou Enlai, the Premier of China. Instead of receiving their report, Zhou demanded them to come up with a statement in support of the new communist leadership. Y. T. Wu and other leftist clergymen espoused the task and presented a draft manifesto that, after some opposition and changes, became a foundational text of Christianity in the new People's Republic. It condemns missionary activities in China as a form of imperialism, pledges loyalty to the communist leadership, and encourages the Church to take up an indigenous Chinese stance toward Christianity. Published on the front page of the People's Daily, the manifesto was accompanied by a campaign to gather signatures. Many Christian leaders and laymen signed, while others refused to do so. After the Korean War broke out, the campaign became an increasingly politicized test of loyalty that became merged with the Campaign to Suppress Counterrevolutionaries. Some view the manifesto as a betrayal of the Church, while others find sympathy for the position of Chinese Christians struggling to reconcile their faith with the changed political situations. The manifesto ended missionary activities in China and the separation of church and state. It led to the founding the TSPM and brought persecution to dissidents.